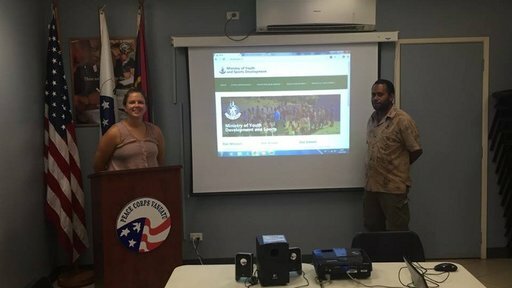 I just completed my four-month assignment in the Peace Corps Response program in Port Vila, Vanuatu. I took a leave of absence from my job, packed everything I own into a storage unit and headed out to a country I had never been to, all in the name of a new cross-cultural experience. The specific job title of my PCR position was web design and development consultant for the Ministry of Youth and Sports, a branch of Vanuatu government. My first experience in the Peace Corps shaped my professional development, so I was stoked to have a similar, more direct experience of professional growth in Response. Why did I take a PCR position in the first place? After I graduated from college, I went straight to the Peace Corps, where I lived and worked in Albania for two and a half years. I applied to grad school while in Albania and started back to school three weeks after returning to the States. I interviewed for the job I currently have at a content marketing agency in Raleigh before graduation, picking up freelance work and starting full-time one week after I earned my master’s degree. Last summer I visited Albania again for a wedding. 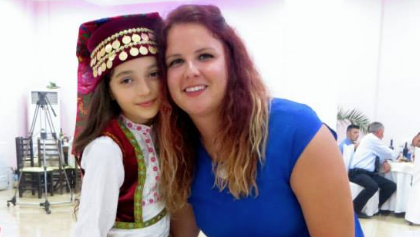 I was welcomed with open arms and that famous Albanian hospitality. I saw the logo I designed for my town on the side of cars, on flags up and down the main road and in the middle of a town news forum. I saw the teenage boys that I played basketball with still playing, using the balls and court provided by a grant I helped write. Two years later, I could still visibly see my work and how it had impacted my community. If I hadn't returned to my town, I would have never been exposed to those remaining parts of my time living there. Development work typically doesn’t provide instant gratification, but showing up two years later sure made it feel like it did. What exactly did I do before I took the PCR position in Vanuatu? Taking my second Peace Corps assignment seemed like the perfect opportunity and refresher from my hectic life 9-to-5 on top of coaching college basketball and teaching a college freshman art class. Even better, my current job let me take a leave of absence, allowing me to come back once my PCR assignment was finished, understanding the value of an experience like this one both personally and professionally. My full-time position as an interactive designer was full of working with some of the most tech-savvy people have ever met, an open bar after 4:30 p.m. and free pizza on Fridays. I made visual and UX design decisions on multiple projects every day: designing apps, websites, social media graphics, interactive tools… you name it. Our clients consist typically of large, Fortune 500 businesses, ranging from software companies to baby clothing lines. For those without a tech background, I sort of make the blueprints of the website, then hand them over to the developer to build the website. I’m typically accompanied on a team with a project manager, project assistant, content writer, UX strategist and web developer. How was my job different in Vanuatu? During my time at my position in Vanuatu, I took on many responsibilities and job titles, and had the opportunity to utilize what I learned while working with specialists in other parts of my industry. I worked as the project manager or product owner, creating a scope of work and requirements documents after meeting with stakeholders of the website, managing expectations and deliverables. I worked as an UX strategist, working with the department in the Ministry through card sorting, developing a site map together, sketching out wireframes and talking through user flows on our website. I worked not only as the designer of the site, but the developer as well. I taught myself a new content management system and dove in headfirst to writing responsive CSS and HTML5 instead of handing over my designs and CSS to the developers. 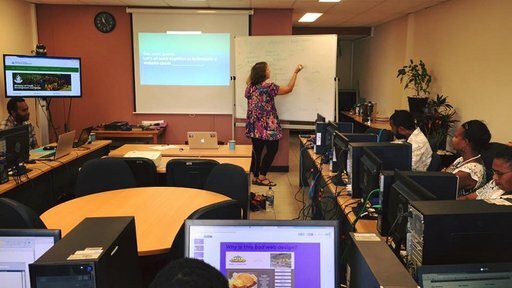 But most importantly, I worked as a teacher, making sure knowledge was transferred to my coworkers in Vanuatu during the web design process, including how to update the CMS after I left. The most important part of development work is sustainability. I finished the development of the website with a month to spare but spent the last month transferring knowledge and training management. People who work in my industry live by the phrase “a website is never finished,” and with that in mind I worked tirelessly to make sure my coworkers would be capable to continue maintaining our website, even if I wasn’t in Vanuatu anymore. My PCR position gave me the flexibility to teach myself new skills that benefited my project and will make me more marketable in the future. I wore the hats of many job titles, and instead of being a specialist, I became a generalist, providing leadership to my department in the Ministry during the process of creating an online presence for them. It’s extremely easy to become saturated with people who know just as much as you do or, typically, even more than you do. The tech industry is constantly evolving and continued learning is essential. During my time in Peace Corps Response, I was able to figure out answers to my own questions because I had the luxury of being able to focus completely on one project during my time there. In Vanuatu, I was presented as the web guru. This not only humbled me, but made me realize that I shouldn’t take for granted how much I do know and how capable I am to lead a team of people, not only from a different cultural background from my own, but a different technical background as well. My PCR position provided me the opportunity to lead a team of ni-Vanuatu, show casing my adaptability in leadership style and adding to my international experience. What else did I do during my time in Peace Corps Response? During your two-year stint as a Peace Corps Volunteer, you have a primary assignment and then secondary projects that surface after you’ve spent some time in your community, things that you might not have planned for or expected. I wasn’t really expecting any of these secondary projects to surface since I was only in Vanuatu for four months, but incredibly enough they did. Timing is everything. I happened to be in town during another Peace Corps Volunteer’s project, which had been under development for more than two years. 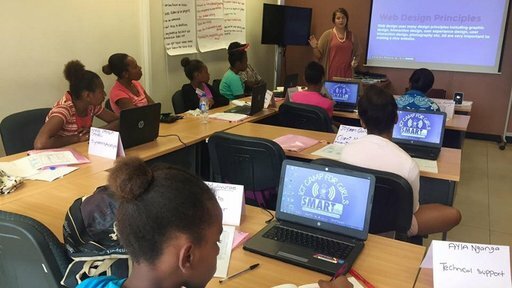 The SMART Sistas ICT Camp for Girls was a week-long camp where girls were brought to the capital and taught the fundamentals of informational technology. I was asked to teach an Intro to Web Design course during this camp. Not only was I able to create a product for an audience other than who I’m used to (locals in Vanuatu who will solely be accessing the site from their 3G mobile phones from remote islands), but aside from my primary assignment I was able to transfer knowledge to almost 10 other islands in Vanuatu through the camp. Another secondary project surfaced during the last few weeks of my service when I was asked by the communication department of the Vanuatu government to hold a training for government employees. I held a professional development training for more than 30 ni-Vanuatu locals, teaching the web design and development process and exposing them to the web development process. My time in Peace Corps Response not only provided professional development opportunities in my field, but in the international development field as well. I was able to gain experience working in another country, using skills I have gained through my previous professional experience. The PCR program provided an invaluable experience to add to my résumé, gave me the opportunity to teach myself new skills to add to my design belt and a great project to add to my portfolio. In short, taking this time to serve as a Peace Corps Volunteer again was one of the best decisions I’ve ever made. I would recommend the Peace Corps Response program to people who are self-starters looking to gain intercultural experience and possibly teach themselves other skills. Brenna Mickey is a humanitarian technologist who just joined the Peace Corps… again. She did her full 27-month service in Albania (2011-13) and is currently a Peace Corps Response Volunteer in Vanuatu. Brenna has her Masters of Arts in Interactive Media and is an interactive and visual designer by trade. She played four years of college basketball and is trying to visit 30 countries before turning 30 years old. Subscribe to IMPACT, our monthly newsletter, to learn more about Peace Corps Response.